Today I have a video I put together last week. The purpose of it, in essence, is to expose apathy within the Church and urge Christians to grow closer to God. That said, if you are not a Christian or have questions and doubts about God, this might not be the best thing for you to watch because you are not the intended audience. The only thing that I am asking is that you leave me feedback. I would love to know how you feel about it and how I could have done it better. Thanks! * Okay, I get it. Its an outrageously long video. If you are up for it, play it at 1.25, 1.5 or 2x the speed using the HTML5 feature to cut down on the time by as much as half. Step 1) Activate it here: www.youtube.com/html5 Step 2) Use the gear on the video to access the speed settings. This was so so fun to compile. A lot of people want questions for tags, awards, interviews, and just Q & A so I decided at the beginning of June to make a list of all I could find. List more in the comments if you want... I might add there myself. 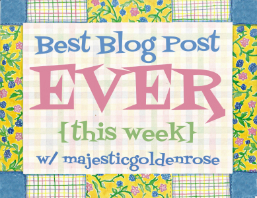 Just this week, I was nominated for the Sisters of The Sisterhood of the World Bloggers Award. I was totally surprised to be tagged but it seemed like a good idea for this. I feel bad answering them without nominating... but I dont want to miss out on the fun either. Sorry that I dont know enough blogs to link to but these questions are yours for the taking....If you want to use a significant number of these questions, it would be great if you would link back, but dont feel like you have to because many of them I had come across myself .....so I cant take credit. 1. What color hair do you have? Dark brown. Black in some lighting and it has lighter natural highlights in others. Only I see that part though, everyone else thinks it looks the same as always or darker if thats the case. 3. Music, writing, or photography? This is a hard one. Depends. Maybe most often music. Adding to the list Pinterest and books would make the choice even harder. I choose Jesus. There. Cant argue with that. Jesus. 5. Dogs or cats? Cats. All the cats. 8. Do you have any siblings? One, Beth. Her brand spankin' new blog is linked here. 9. What is your favorite TV show? Dont watch TV :) lol, sorry. 10. What books do you like to read? Amish, Historical Fiction, Sci-fi/Dystopian. See right-sidebar for good ones. 1. Tell us about yourself! What are you known for? 2. How would you describe yourself in three words? 3. Do you have any published works? 4. When and why did you start your blog? 5. What is your blog mainly about? 6. Can you tell me about your idea reader? 7. What are some cool things going on on your blog? 8. Tell us about your blogging experience! 9. What was it that started you on utilizing social media? 10. What social media platform do you use the most? 11. How did you get the name of your blog? 12. Would you change your name? 13. Do you have an alias? Would you use one? 14. What do you do with your free time? 15. What are some of your favorite blogs? 16. Which blogs give you the most traffic? 17. What is the most challenging aspect of blogging for you? 18. Be honest! What is one thing that you truly hate? 19. Would you rather travel through time or space? 20. What is your strategy? 21. What are some things you can not live without? 22. If you had a bad day, what makes it better? 24. What do you thing about college meal plans? 25. Do you like writing or emailing better? 26. What is your favorite color? 27. What type of music do you like/dislike to listen to? 28. What is your favorite song? 29. Do you (did you) play any instruments? 30. Would you rather stay home and watch movies, read a book, or go shopping? 31. What is your favorite book? 32. If you would go back in time, when? 33. The author of your favorite book just showed up at your front door. Who is it? What is your reaction?? 34. Do you have siblings? 35. Where have you traveled and where is the best vacation memory you ever had? 36. If you had to spend the rest of your life on an island, and you can only ask for one thing besides clothes and food, who or what is it? 37. If you could pick a place to stay for the rest of your life, where is it? 38. Have you been to any national parks? 39. What is your dream vacation? 40. What is your favorite season? 41. What do you do when you are home alone? 42. Do you sing in the shower? 43. If you could spend the day with the President, what would you do? 44. What can you hear currently? 45. Are you a cat person or a dog person? 47. What are your opinions on toe socks, crocs, and camo? 48. Have you cried of happiness? 49. Would you rather watch a movie on DVD or in theater? 50. Where are you at? What is on the walls? 51. When did you last step outside? What were you doing? 52. Find the nearest book, open to page 18 and read the sentence around line 4. 53. Is the glass half empty or half full? 54. Q: Have you ever been in a beauty pageant? What do you think of Toddlers and Tiaras? 55. Q: Have you ever had to wear a uniform to school? 56. If you don’t have any, have you ever thought of getting a tattoo? 57. Go http://www.anagrammer.com/scrabble/). Does your name make any interesting anagrams? 58. Do you have a garden? 59. Do you have an HOA? Would you move into an area with one? 60. Would you ever consider studying or living abroad? 61. Do you like to dance? 62. Tell us something about you most people don’t know. 63. Do you love your job? 64. Its midnight and your best friend is knocking at the door. What do you have to say? 65. If you could throw any kind of party, what would it be like and what would it be for? 66. Do prefer night or day? Are you a night owl or an early bird? 67. What is your favorite show? Why? 68. Who are your favorite YouTubers? 69. What is your favorite verse? 70. Pizza or a cheeseburger? Something else? 71. You just found a door in the back of your closet. You: a. Go in of course b. Cover it up act like its not there c. Wait for a friend explore with he/her d. Go and tell an adult. Witch do you pick? 72. What was your favorite food when you were a child? 73. Do you lean towards being an introvert or an extrovert? 74. What do you look like? 75. Which celebrity do you get mistaken for? 76. Do you like roller coasters? Water rides? 77. What are your favorite rides and/or theme parks? 78. What do the online quizzes say about you? 79. What would you do for a Klondike bar? 80. Polka dots or stripes? 81. What was the last movie/show/book that made you cry or tear up? 82. How far from your birthplace/hometown do you live now? 83. Can you touch your nose with your tongue? 84. Have you ever stolen a street sign? 85. Do you take shampoo and conditioner from hotels? 86. How many rings before you answer the phone? 87. Which senses would you want to lose/keep? Is sight or hearing more important to you? 88. What type of candy do you like? 89. Do you like dark chocolate? 90. Have you kept a diary or journal? 91. What job do you want to have? 92. What did you want to be as an adult when you were a kid? 93. If you could acquire one skill immediately, and be proficient at it, which skill would you choose? 94. Sweet or dill pickles? 95. Have you ever had a pet? Do you want a certain pet? 96. What animals do you want when you grow up? 97. What is your favorite body part? 99. Do you have a beauty tip? 100. What is your fashion style? 101. Do you wear scarves, carry a purse, add bracelets, etc? 102. Do you have a favorite/least favorite trend? 104. Do you like shopping at fabric stores? 105. Twirl or cut your spaghetti? 106. What is your catch phrase or something you say a lot? 107. Have you played any sports? 108. What sports teams do you follow? 109. How fast do you run? 110. Do you like your job? 111. What is your favorite indoor/ outdoor activities? 112. What chose do you absolutely hate? 113. What religion are you? 114. Why do you dress modestly? 115. Have you tried any new foods that you like? 116. What are some things about you that we should be jealous of? 117. What are some jealousy triggers that you have? 118. Do you have any phobias? 119. Do you dream? Do you get nightmares? 120. What should you be doing? 121. Would you rather spend a day walking backwards or with a smiley face sharpied on your forehead? 122. Have you ever been to a bonfire party? 123. Would you rather find yourself in a cliché YA love triangle or have no romantic interest at all? 124. What makes you hesitate? 125. What is your favorite weather? 126. If you were immortal for a day, what would you do? 127. How do you bookmark? How do you treat books? 128. What if you don’t like a book—quit or commit? 129. Do you skip to the end? Do you reread books? 130. Do you watch the news? Which channel? 131. If you could choose to stay a certain age forever, what age would it be? 132. If you knew the world was ending in 2016 what would you do differently? 133. Do you count your steps? 134. Would you rather be attacked by bees, a bear, or a shark? 135. If you won the lottery what is the first thing you would do? 136. If you were given $1000 what would you do with it? 137. What is the worst problem in society today? 138. Something you feel strongly about? 139. Do you like writing in public or when you are alone? 140. If you could choose anyone as a mentor who would you pick? 141. Who are your best friends, the people that mean the most to you, and any author whose book has dramatically changed your life? 142. If you were to write your younger self, what would you say? 143 What is the best piece of advice you've ever gotten? 144 What is the best thing you have ever splurged on for yourself? 145 What do you miss about your childhood? 146 Winter evenings or Summer mornings? 147. Do you tend to organize or leave a mess? 148 Do you like hot tea? If so, what are some of your favorite kinds?. 149 If you could relive a day in your past which would it be and why? 150 What is the perfect weather to you? 151 What person in your life are you closest to and how did you meet? 152 What has been the highlight of your week? 153 what were you doing at 8 am this morning? 154 what were you doing 45 minutes ago? 155 what is your favorite candy bar? 156 what is your favorite ice cream flavor? 157 do you take vitamins daily? 158 do you go to church every Sunday? 159 do you prefer Chinese food over pizza? 160 do you drink your soda, coffee, etc with a straw? 162 -do you go in at a fast food place or just hit the drive thru? 163 what is your favorite number? 165 biggest annoyance right now? 166 can you say the alphabet backwards? 167 favorite pair of shoes you like to wear all the time? 168 how did you get your worst scar? 169 Favorite type of fruit pie? 170 Occupations you wanted to be when you were a kid? 173 Ever take dance lessons? 174 Is there a profession you picture your future spouse doing? 175 Worst pain, best joy you have ever experienced? 176 Ever won a spelling bee? 177 Own a record player? VCR? Cassette Tape? Viewmaster? 178 Hot tea or cold tea? 179 Iced coffee or hot coffee? 180 Can you swim well? 181 Ever won a contest? 182 Have you ever had surgery? 183 Can you knit or crochet? 184 Best room for a fireplace? 185 Do you want to get married? 186 Do you cry and throw a fit until you get your own way? Do you show no emotion at all? 187 Do you sleep with your closet doors open or closed? 188 Do you like to use post-it notes? 189 Do you have freckles? 190 Do you always smile for pictures? 191 Do you ever dance even if there's no music playing? 192 Do you chew your pens and pencils? 193. Do you still watch cartoons? 194 Where would you bury hidden treasure if you had some? 195 What do you drink with dinner? 196 Were you ever a boy/girl scout? 197 What’s your favorite kind of sandwich? 198 Best thing to eat for breakfast? 199 What is your usual bedtime? When do you get up? 200 When you were a kid, what did you dress up as for Halloween? 201 How many languages can you speak? 202 Are you afraid of heights? 203 Do you like spaghetti? 204 What is your hair like? 206 What is your favorite pattern? 207 Music, writing, or photography? 208. Fav website: Twitter, Pinterest, Instagram, Tumblr, etc ?. 209: Email, text, or call? 210 How do you spend your days aside from blogging? 211 What do you do when you’re nervous? 212 If a crystal ball could tell you the truth about yourself, your life, the future or anything else, what would you want to know? 213 When did you last cry in front of another person? By yourself? 215 Do you watch or binge Netflix? 216What sort of programs do you watch? 217 What is one thing you want to do but won't because it's against social norms? 218 Do people know about your blog? 219What post has got the most hits/comments? 221 Are your friends older or younger? 222 If you could erase your memory of one book so you could read it again, which one would it be and why? 223 Book you could read a hundred times and still love it? 224 What is your dream house? 225 How many kids would you like? 226 How many siblings do you have? 228 What’s one thing you love about yourself? 229 Sum up your life in one sentence. 230 What is one question you have for God? 231 What’s the most exotic food you’ve tried before? 233 What fairy tale/classic book/princess story would you want to fall into, either as a Main Character or someone in the back ground? 234. What is important in life? 235. Do you like the beach? Which beach or area? Did you rent, hotel, camp, live there, or stay via cruise? 236. Do you like meme's? Gifs? Emoji's? 237. ^^How do you say meme and gif? 238. What would you name your kids? 239. What music/art/non-STEM thing do you wish you were good at? 240. Hate pants or hate skirts? 241. Ebooks or hardback or paperback? 242. Buy books or go to the library? 243. Where were you on 9-11? 245. muffin or cupcake? bagel or donut? 247. What do you want for Christmas/birthday? 248. What (non-relationship) breaks your heart? 249. Which history topic is the coolest to learn about or read? 250. What games did you play as a kid (online, CD-ROM, handheld, board/card games, outside, etc)? 1. Thanks for coming to celebrate with my Linky, Blog-Hop, Linky Party and/or Link- Up. 2. Link up any post that fits into the awesome and wholesome categories to this week’s linky. 4. Please place the linky button on your sidebar or otherwise link it where I can find it. 5. Spend a moment to comment on a post or two and subscribe so you can come back next week! For this post i will be telling you 20 things i would absolutely HATE to be told whilst my hairdresser is doing my hair. As a frequent visitor to the hairdressers (curse.you.split.ends.) I constantly worry for my hair, People make mistakes and although hairdressers are trained, I get scared. A lot. 1. "Oops..that wasn't supposed to happen"
2. "You wanted that bit shaved..right?" 3. "Your hair is super damaged,wow" - Like Omg, I am super aware,I'm not proud of it *tears emerging* but i'm..i'm aware. 5. "I'll be right back" - NO! NO! I REFUSE TO LET YOU LEAVE ME WITH FOIL ALL OVER MY HEAD,legit my crush could pass the shop..
6. "Have you tried buying (insert 10 hair products here) Its super good"- Keep your ads away from me. 7. "Dont worry, you'll love this" - I bet i wont. 8. "Oooh i can experiment with this" - MY HAIR IS NOT A CHEMISTRY LAB, DONT YOU DARE. 10. "Just before we start, i must warn you, I LOVE to talk"- This is a sign your 30 minute session, will become the LONGEST 30 minutes of your life, especially when your rubbish at socialising like me. 11. "Do you smell burnt hair? "- Wait..WHEN DID YOU START CURLING MY HAIR? 12. "Would you like this extra treatment for only (insert high cash price here)"- NOOOO! I bet that costs so much more money, i'll just find a cheap diy treatment on wikihow or something. 13. "Jheez..What products do you use" - HEY! I KNOW WHAT YOUR TRYING TO SAY! 15. "It will grow back, don't worry love"
16. "You should've came here sooner! "- Look it was either coming to the hairdresser or watching more Netflix. I don't know about you but i think i made a smart decision. 17. "We ran out of *insert colour here* dye so we decided to use *insert colour here* instead"- Now this could either go good or bad, Bad would be if i wanted a red dye job and they gave me pink. 18. "You ever thought of having a fringe?" 20. "This is my first day out of training! "- um.. so i have to go..LIKE RIGHT NOW. And That Is It!, Thanks For Reading! If you enjoyed this post feel free to check out my blog! Alright so June 4 I got this lovely package in the mail. Beautifully wrapped! Ive been desperately needing a new one and eager to try it out. I ordered it in Peacock Blue and none of the pictures I took really do the color of it justice. Keep that in mind! Ive had 1 of these before from another seller, but it was a different type of silk. This is made out of : Grade A 19mm Mulberry Silk, as well as satin ribbon and elastic. Silk is something you get what you pay for, so dont fret over the pricetag. Connie (who made this review possible with a discount order) promised me that this will last for years. I'm sure that many of you are wondering whats the big deal about them, right? Here's the thing: This is super high quality silk and really great for keeping tangles and bed head down at night. Some of us really need moisture on our hair and this helps keep our hair happy. I can wear my hair in braids, down, or in a bun with this on and my hair is perfectly fine. The first night I had woken up in the middle of the night. I was very happy that it was staying on. I also find that sometimes I get the little tag in front (you can see that below) but its not a big deal and you cant feel it or anything. If you get one and dont like the tag, I'm sure you could safely remove it. I am drafting a "This is the right way to grow out your hair" ebook and I believe a quality sleepcap is a must! This seller has an abundance of colors so you will definitely want to check out her shop on Etsy. She also sells masks, scarves, and pillow cases if you dont think a sleep cap is right for you.